On Saturday I completed my fourth half marathon in Shelburne, VT. The morning was very cool and overcast which is actually great running weather. 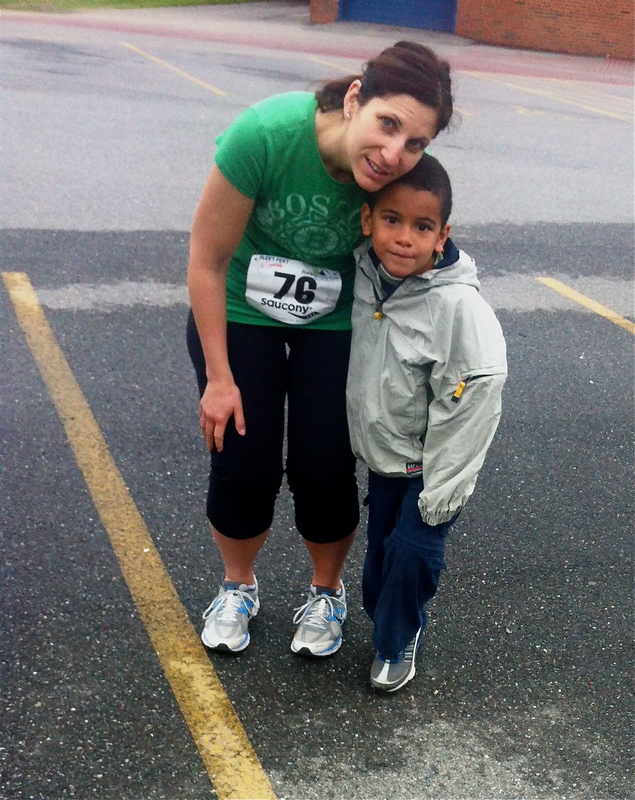 I always have to get a pre-race photo with my little guy. So here we are. He is actually really mad that he can’t go play on the huge school playground behind us. There was enough wind to make me put my sweatshirt on at the start of the race even though I knew I would want to ditch it a few miles in. This was a very small race. They cap registration at 450 runners, but only 162 runners signed up this year. It is touted as being one of the most beautiful courses in New England. 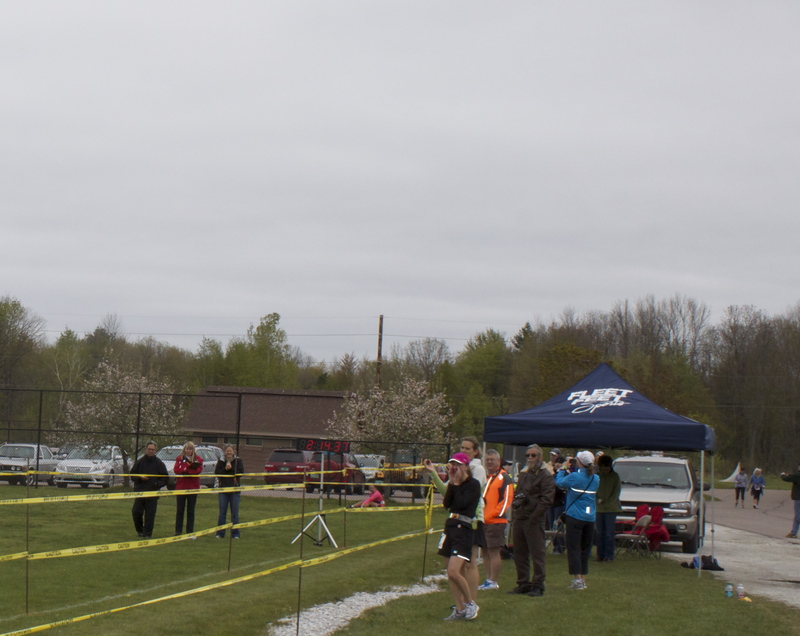 The race descriptions reads, “The course will run you through some of the area’s most picturesque scenery including a portion of Shelburne Farms, the historic Ti Trail and along Shelburne Bay. ” It was indeed a gorgeous run. It was also an incredible hilly run. I absolutely loved the mix of trail and on road running. Running alongside the lake was so tranquil. The scenery made up for the lack of spectators. The race started promptly at 7:30. It was extremely well organized from start to finish. There was no lack of volunteer support on the course and adequate water stations. As I mentioned in my last post my plan was to enjoy the race, have fun and run safely so as not to re-injure my shin. I had no pain in my shin as the race began. I started out at a moderate pace to get my breathing under control. Soon I found my groove and I flowed nicely through the first couple of miles before the first big hill. I never wear my Garmin when I race and there were no time clocks along the way. I felt a bit slow especially with the constant uphill climbs and minimal downhill returns. By mile 8 I was ready to tear off my sweatshirt. I was in need of fuel and there was no water station until mile 10 so I ate my Gu while walking up a steep incline. I changed my bib to the front of my T-shirt and tied my sweatshirt around my waist. That made me feel instantly better and I picked up the pace again. I’m proud to say that was the only hill I walked up. I played some mental games between miles 9-11. I kept telling myself that it is ok not to achieve a PR (personal record) in every race. I started to feel some discomfort in my left shin, but no pain. For the last couple of miles we were on a quiet trail. I loved it so much. I felt like I was alone on a training run. I felt my pace quicken naturally and before I knew it I was back on the road. 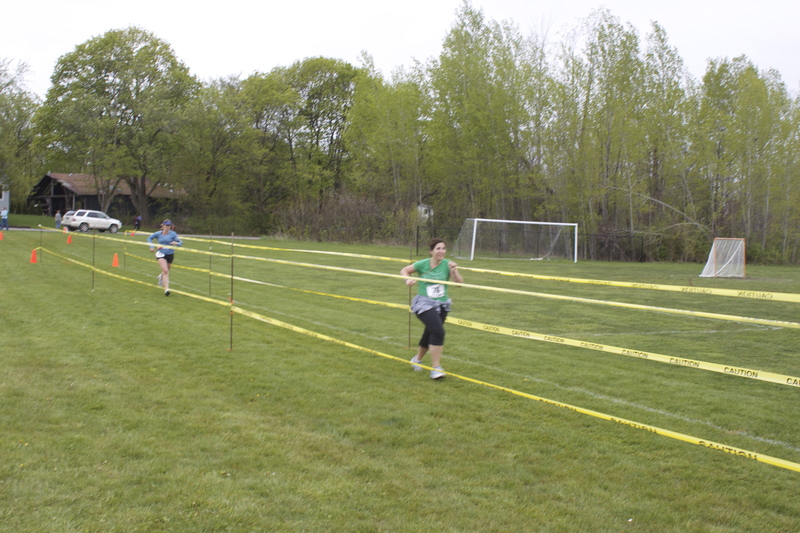 The finish line was only about a half mile away. I turned down the drive to the finish line and as I entered the chute I saw Carlos and Orlando. As bad as I am at taking photos, my dear husband is worse!! He did manage to get this one, just as I noticed the time clock ahead. Tears welled up in my eyes and I felt a surge of energy rise up inside me. I bolted for the finish and crossed with a new, very unexpected PR. I know it’s really hard to read but if you squint and hold your computer right up to your face you might notice the 2:14. Here is what my finish looked like in numbers. I don’t usually break down all the stats for a race, but the results page for this race made it very easy to do so. I also pulled up all of my half marathons to visualize the progression of my times. They are in order of first to last. I am really proud of my time. Despite the shin issue I felt well trained for the race and I am pleased that the speed training I have been doing since the Disney Marathon seems to be effective. I walked around the rest of the day with a huge grin on my face. Running challenges me in a way nothing else in my life ever has. I am in awe of what my body is capable of doing. Running truly makes me feel amazing. This was a wonderful race experience and overall a great run. Of course I also used it as an excuse to enjoy a mini family weekend getaway. We stayed in Burlington for two nights. The weather perked up as the sun came out on Saturday afternoon. It turned out to be a very pleasant and relaxing weekend. Nice job!! Sounds like you had a great race! Will you be doing Hartford again this fall? Thanks Stephanie. I’m working the weekend of the Hartford half. Are you running it? Thanks so much. I honestly never imagined I would enjoy it as much as I do. I was waiting for the recap! Woot on a PR! Way to rock it – love the picture of you and Carlos! Thanks Biz! It was a great weekend. It felt so great to finish strong. Thanks Biz!! Thank you very much Sam. I appreciate that. Thanks for the encouragement Sam. Congrats on a great race and the PR! I was kinda waiting for the recap too 🙂 I’m so glad you were able to finish it! I hope your shin continues to be ok. Yay, so happy for you! Thanks Jane. I’m still taking it easy on the shin just to make sure it doesn’t become an issue again. Great run! I’m happy for you and it seems like you enjoyed the run. Thanks Emily. I really did enjoy myself. Woo-hoo! In some ways the unexpected PR is almost better than one you know you’re going for and hope to have in the bag. Nice job! Amazing! Great job on the PR, sounds like a great race. Hi Aimee! Yay about your new PR!! I loved the play-by-play of your run! There are so many good vibes from this post. Clearly, you got the best of that little mind game. Happy mother’s day! You are such a good role model for your son! Look at what a strong mama he has! She always goes for it! 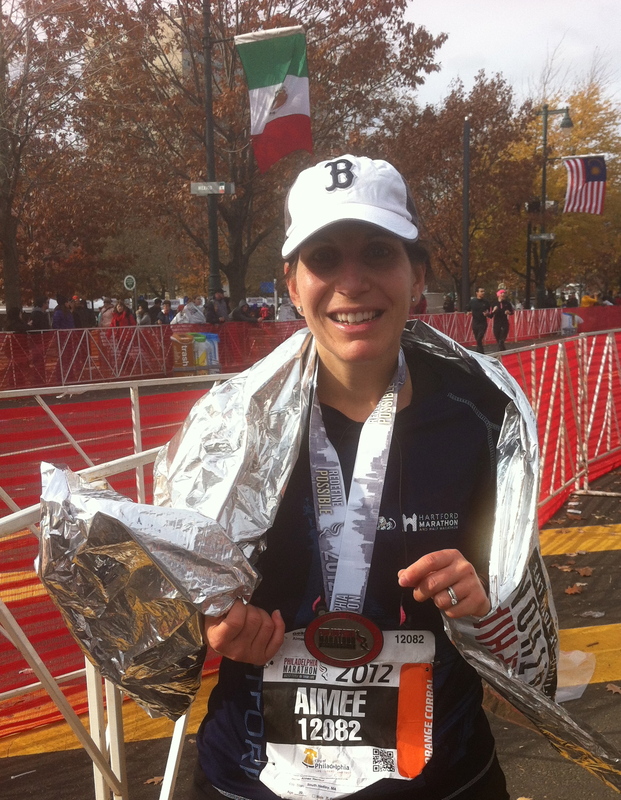 COngratulations Aimee!!! You truly are amazing! And enjoy your Mother’s day tomorrow!